The College of Sapiarchs is built atop a literal maze of halls and corridors, a repository of ancient knowledge and royal ceremonies, as delineated in the many Scrolls of Praxis that all Altmeri monarchs must study before ascending the Throne of Alinor. 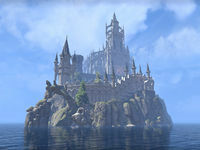 The College of Sapiarchs is an institution located on an island just west of the city of Lillandril. It is home to the Sapiarchs—Summerset's foremost scholars and Keepers of the Crystal Tower led by Sapiarch Larnatille. A portal on the western edge of Lillandril provides the only means to access the college, which cannot be used before Proxy Queen Alwinarwe notifies Portal Master Astirhil of her permission in order for you and Valsirenn to enter and inform the Sapiarchs of a threat to the Crystal Tower. When entered turns out that the Court of Bedlam, through Mephala's Earl Leythen, invaded the college with Daedra and massacred most of the Sapiarchs there. The portal that leads to the college. The well-tended gardens with a pond. View of the main building and the steps leading up. The grounds and main hall of the college can still be accessed after The Tower Sentinels has been completed, but the labyrinth can only be accessed through the main hall itself - players will be able to exit from the labyrinth the courtyard still. There will also be no non-player characters present on the island, but the hostile Daedra remain. The corpses near the portal dais all wear Altmer style light armor instead of Sapiarch style. This page was last modified on 23 February 2019, at 09:19.